The present paper analyzed the environmental assessment of short rotation willow plantations in Sweden based on the standard framework of Life Cycle Assessment (LCA) from the International Standards Organisation. The analysis is focused on two alternative management regimes for willow plantations dedicated to biomass production for energy purposes. The data used included the averages of a large sample of commercial plantations. One of the scenarios is carried out under nitrogen based fertilized conditions and the other under non-fertilized management with total biomass yields (dry weight) of 140 t/ha and 86 t/ha over a 21 and 22-year life time respectively. The environmental profile was analyzed in terms of the potentials for abiotic depletion, acidification, eutrophication, global warming, ozone layer depletion, photochemical oxidant formation, human toxicity, fresh water aquatic ecotoxicity, marine aquatic ecotoxicity and terrestrial ecotoxicity. In addition, an energy analysis was performed using the cumulative energy demand method (CED). The application of nitrogen based fertilizers allows an increase in the biomass yield per ha of up to 40% although the contributions to almost all impact categories, particularly the eutrophication potential and toxicity potential impact categories are also considerably higher. Conversely, due to the higher biomass yields achieved with fertilization of these willow plantations, that regime presents a better overall environmental profile in terms of energy yield and global warming potential. ► Swedish commercial short rotation willow plantations were assessed from a Life Cycle Assessment perspective. 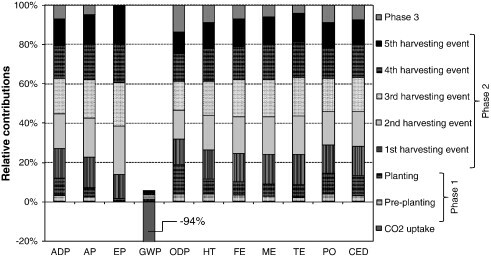 ► Two alternative management regimes for energy based willow plantations were compared. ► The data used included the averages of a large sample of commercial plantations. ► The processes behind the highest impact contributions were identified. ► Plantations under fertilized conditions present better results in terms of energy yield and global warming potential. MOLA-YUDEGO B, ARONSSON P. 2008. 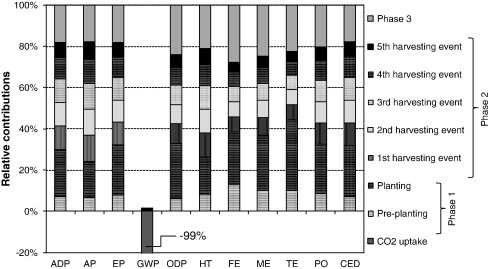 Yield models for commercial willow biomass plantations in Sweden. 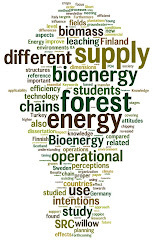 Biomass and bioenergy 32(9):829-837.